Ahh, Sydney in the wintertime. It’s a cool place (but they say it gets colder), so let’s have a peek at what’s in store for us this July. You won’t be disappointed! We shall begin with a big, hefty slice of fine art, courtesy of our pals at the Opera House. Badu Gili, which translates as “water light” in the language of the traditional custodians of Bennelong Point, is a daily exhibition that celebrates the work of First Nations artists from across the country, including the Torres Strait Islands. Every day at sunset (and again at 7pm), the eastern Bennelong sail becomes a gigantic projection screen for a stunning array of artwork, complete with its own soundtrack. It doesn’t cost anything to view, of course, and its suitable for all ages. We can certainly think of worse ways to spend seven minutes a day. Well, well! 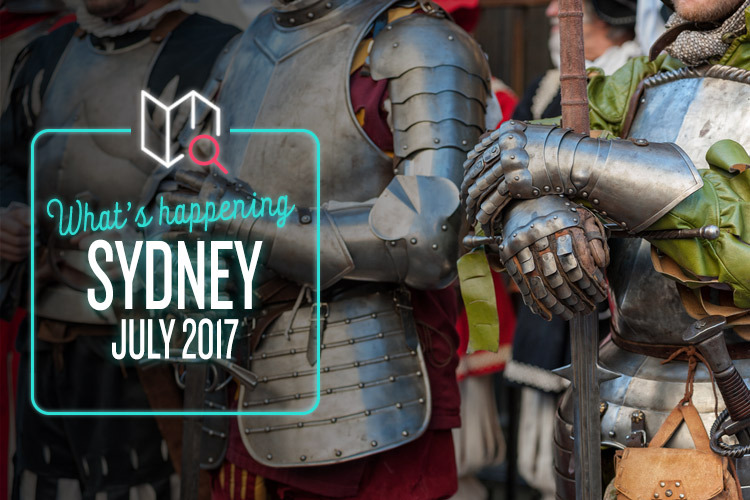 The Winterfest Sydney Medieval Festival is back once more, and bringing all the fun of the middle ages (knights, jesters, crafting, etc.) with none of the tedious baggage (serfdom, witch trials, fatal dysentery, etc.). There’s archery, falconry, jousting, costumes, cooking, storytelling, re-enactments, and a huge range of merchants and expert artisans peddling their handmade wares. Now entering its 11th year, Winterfest remains a fantastic day out for all and sundry, and it’s definitely not to be missed. Otherwise it’s the stocks for ya, you cloddering, crooked-nosed knave. Back to the 21st century now, where it’s time to indulge in Sydney’s premier winter arts festival. This year’s Bondi Feast features more than 150 different music, theatre, comedy and visual arts performers spread over two whole weeks. This marvellous extravaganza takes over the entire Bondi Pavilion, with big names like Tessa Waters and Ethan Andrews mingling with a host of up-and-coming talents. From a man obsessed with Animorphs to a 100% improvised musical, there’s quite literally something here for everyone. Check out the full program on the festival’s website and see what takes your fancy. Ever since its humble beginnings as the BBR (Bleu Blanc Rouge) Festival, the recently rebranded Bastille Festival has gone from strength to strength. It’s basically just a gigantic, French-inspired street party, and it’s more fun than dancing the gavotte whilst chugging wine from a little Napoleon hat (which you can probably do here somewhere, if you know where to look). There’s eight wine bars, four unique food villages, and all sorts of musicians, street performers, workshops and special events to keep you entertained. It’s a glorious fusion of arts, food and booze, and it’s just what le docteur ordered to blast away the winter blues.